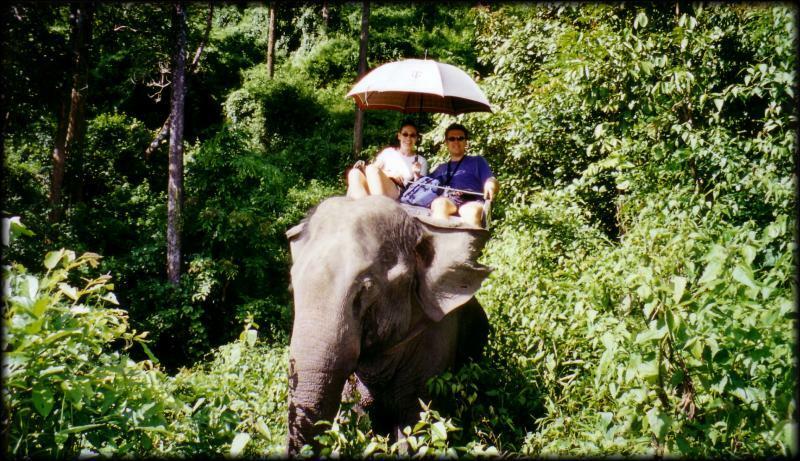 We went to the Elephant Conservation Center and took a ride through the jungle on an elephant. The next morning we got up early to go to the Thai Elephant Conservation Center, about 1 hour back towards Lampang right off the highway. We had frustratingly passed it the previous day on the road in to Chiang Mai, but couldn’t figure out how to get the bus driver to stop, let us get off, and get our bags from underneath the bus, etc. Besides, I don’t think the long-haul buses will stop at points not on their route. If we’d spoken Thai, we might have been able to work something out, but it seemed too risky. So anyways, we daytripped out from Chiang Mai first thing in the morning. The bus driver understood where we wanted to go (we used the word "elephant" in Thai from our Lonely Planet phrasebook – some giggles all around but it worked!) and let us off right outside the center just as it was opening (8 am). From the main gate at the road, it’s a 1km walk to the center itself. We got a ride with someone in to the center. There is a one way road that eventually leads to the center – but if you’re walking, *MAKE SURE* you take the RIGHT turn, then turn LEFT at the big radio tower. Otherwise you’ll be walking for 2 hours instead of 30 minutes. With no shade. 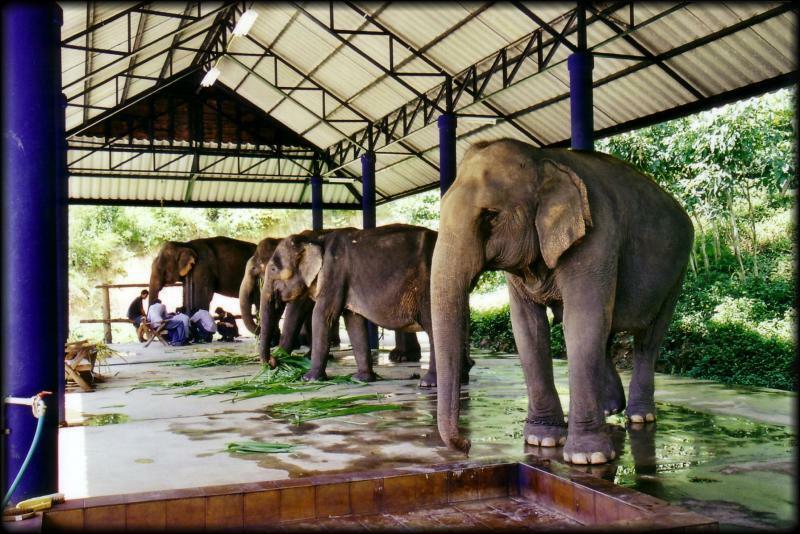 There is an elephant hospital at the center, where they take care of elephants brought in from neighbouring countries that are hurt. We took an hour long ride on an elephant through the jungle for $20 US. Quite an experience. It was very pleasant. 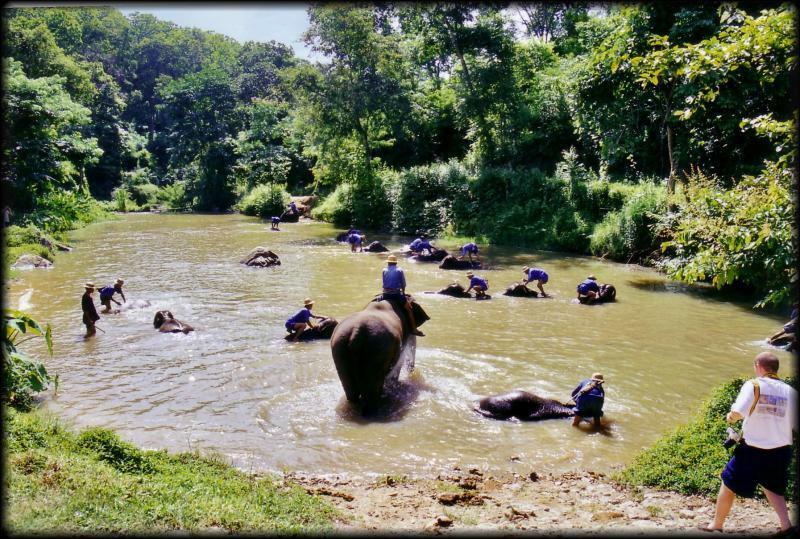 We then saw the handlers (mahouts) bathing the elephants in the lake, and we watched the show. In the show, they demonstrate how the elephants have been trained in traditional logging techniques. They can stack wood, carry logs, etc. Next was the inevitable zoo/circus-like part of the show. The elephants "painted" and "played music" as Wendy cringed. We headed out to see the elephant hospital. Here we saw several animals being treated for pretty painful looking injuries – gangrenous feet, big cuts, etc. The ECC takes in animals from Thailand and neighbouring countries that have been injured, and nurses them back to health. We walked back out to the road (even the quick way is not so quick, when it’s the beating noon-day sun and there is no shade at all). Of course, we *just* missed a bus, and had to wait with no shade for 30 minutes for the next bus. We never found out about any organized tour packages from Chiang Mai to the ECC. Anyways, we finally made it back to Chiang Mai, checked out a few wats (one of which featured a very horny 3 legged dog. Believe me, that’s talent!) and wandered down the street where we had seen the huge market the previous day. It was now eerily empty. We made our way back to the hotel whereupon we made the biggest mistake of our trip to Thailand: we got a cab to the airport and left!